"Ahh, First Boy is back! ", she says as Son #1 walks into the salon. He arrived yesterday, exhausted from the gruelling 16-hour trip, and I had gone into "nesting" mode: his old room revived with fresh smelling sheets, desk dusted, bathroom sparkling clean; Coke, chips, and chocolates made their way back into the pantry; avocados mashed into guacamole. And of course, I made one of his favorites, Fabada, a dish originally from Asturias, Spain and adapted by the Spanish colonies into their own version of a bean stew, flavored by ham hock, chorizo, bacon or any other pork product. Unfortunately my butcher ran out of ham hock, so in keeping with the porky theme, I used a slab of ribs instead. 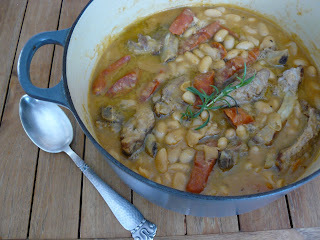 This version lacked the smoky richness from the ham hock, but it was still comfort food. Welcome home, First Boy, welcome home. Season pork ribs with salt and pepper. In a heavy deep pan, heat olive oil and fry ribs until well browned. Remove and set aside. 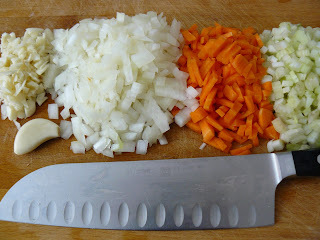 Add celery, onion, carrot, and garlic to pan. Sprinkle pimenton. Saute for 5 minutes, or until onion is transparent. 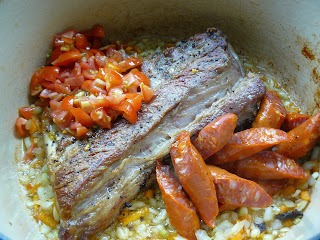 Return ribs to pan, add sliced chorizo and tomatoes. 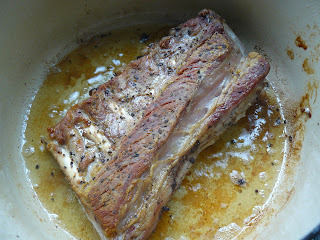 Pour in water, cover and boil for about 30-45 minutes until pork ribs are tender. 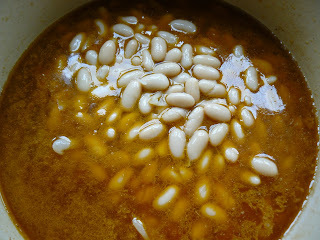 Add the beans and boil for another 30-45 minutes until stew has thickened, making sure to stir up beans regularly to avoid sticking to bottom of pan. Drizzle olive oil on the stew just before serving. you already know how i feel about your writing so i'll comment on your photography instead - for someone who asked me on tips for food photography, are you sure you're not just being polite? ;)... your photos are well composed, we might need to adjust a bit on contrast and lighting but nothing that photoshop can't tweak :)... i've been meaning to ask you, have you done a photography course before? if you haven't maybe you should consider doing that as well (on top of all the other things you do well) as you definitely have an eye for it. That recipe looks like a chore. Kakatamad to prepare. I have always been a lazy cook but when I find a recipe I like, I work on it. Can I just hire you as my personal chef? Hahah. It does require a bit more steps, Leng, but it's worth it. This is true comfort food!